Maynard Luther Hill was born in 1926 – the year before Lindberg’s historic trans-Atlantic flight – and died last week at the age of 85. 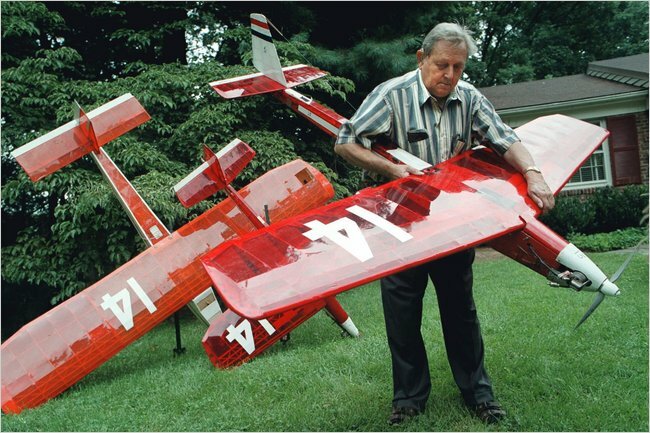 For most of Mr. Hill’s life, he was obsessed with model airplanes and with pushing the limits of their capabilities. He set 25 world records for speed, duration and altitude, for both powered flights and gliders. The culmination of his decades of devotion to the design, construction and flight of model aircraft came at the age of 77. Nearly blind from macular degeneration and mostly deaf as well, Mr. Hill’s 11-pound model plane, the Spirit of Butts Farm – constructed of balsa wood and mylar, with a 6 foot wingspan – made the 1,900 mile trans-Atlantic crossing from Newfoundland to the west coast of Ireland in just under 39 hours. For this historic flight, as well as his lifelong advancement of the hobby, Mr. Hill will long remain a legend among aeromodeling enthusiasts. “By age 9,” once Mr. Hill wrote in an essay, “I had acquired a fairly serious addiction to balsa wood and glue.” He even admitted that on the third day of his honeymoon he went to the store to purchase those items. So where does craftsmanship end and obsession begin? Do craftsmen simply seek to replicate accepted standards of perfection…building a model airplane that’s flawless in design or performance; compared with those who are determined to “do something great” by re-defining perfection…building a plane that’s faster, lighter, sturdier or more elegant than existing models? Shakespeare, Beethoven, Emily Dickinson, Albert Einstein, Frank Lloyd Wright, Margaret Mead and even Steve Jobs were all obsessed, and have set the bar higher for those who follow. Like Maynard Hill, these game-changers provide craftsmen with the understanding that perfection can always be improved upon.